Strategy for a productive Birdathon typically involves starting early in the day at a good site (i.e. one where a wide variety of species are singing) and not lingering in any one area for long. However, this being my tenth Baillie Birdathon, I decided to throw conventional wisdom to the wind and plan my day a bit more in the spirit of the event. After all, the Baillie Birdathon is organized by Bird Studies Canada to support the Canadian Migration Monitoring Network, and the majority of the funds that I raise go directly to the Migration Research Foundation for ongoing programs such as our banding program at McGill Bird Observatory and studies on Short-eared Owls. So, what more appropriate way to plan the day than to start with a morning of banding at a migration monitoring site, followed up by some strategic short sidetrips along the way home. This being my first spring in Alberta, I didn't know quite what to expect, and traveling almost entirely through unfamiliar territory only added to the suspense of the day. My day began a bit before 5 a.m. on Sunday May 20 in one of the trailers set up for researchers at Dinosaur Provincial Park, a couple of hours east of Calgary. There in one of the cottonwood plains among the badlands, the Calgary Bird Banding Society has set up a pilot migration monitoring program this spring, and although the location doesn't conform to the setting of typical migration hotspots, it is a habitat island of sorts amid a largely arid region, and initial results have been promising. 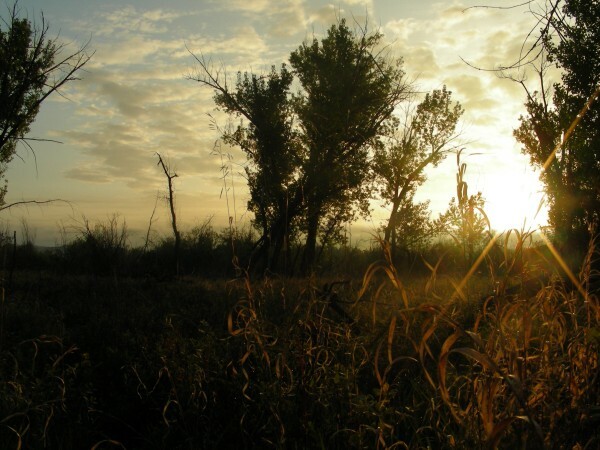 Sunrise in the cottonwood flats along the Red Deer River in Dinosaur Provincial Park, Alberta. Since it was a cool morning (just +2 Celsius), the birds were rather quiet for the first while, so I decided to delay the start of the count - after all, the Birdathon rules are to observe over any 24-hour period in May. 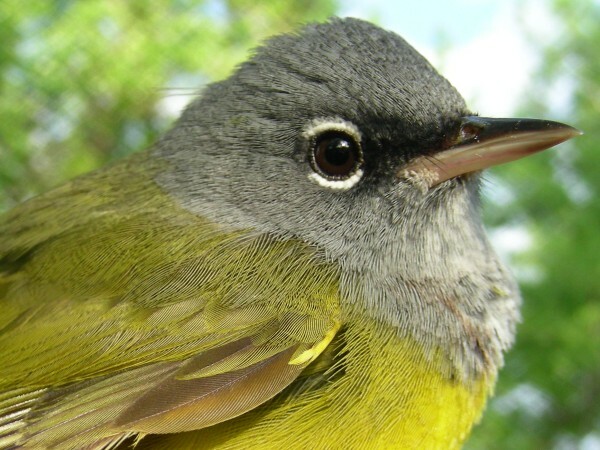 It was around 7:00 a.m. when the beautiful adult male MacGillivray's Warbler below made its appearance - and different spelling notwithstanding, that seemed like a good sign for the kickoff to a day that would in part support McGill Bird Observatory. In many plumages, MacGillivray's and Mourning Warblers are quite alike, making their identification a considerable challenge. Fortunately, my first ever MacGillivray's Warbler was this immaculate adult male that left absolutely no doubt about its identity. Gradually species got added to the list. House Wrens and Least Flycatchers were by far the most abundant species in the banding area, but a variety of other species were present too, ranging from Yellow-bellied Sapsucker and Red-shafted Flicker in the trees to Belted Kingfisher and Blue-winged Teal along the river, Spotted Towhee and Brown Thrasher in the shrubs, and Turkey Vulture and Whimbrel flying past overhead. For the most part, the wrens, flycatchers, and occasional sparrow or warbler in the nets kept us busy. However, when things got a bit quiet, that allowed for some exploration of the adjacent badlands. 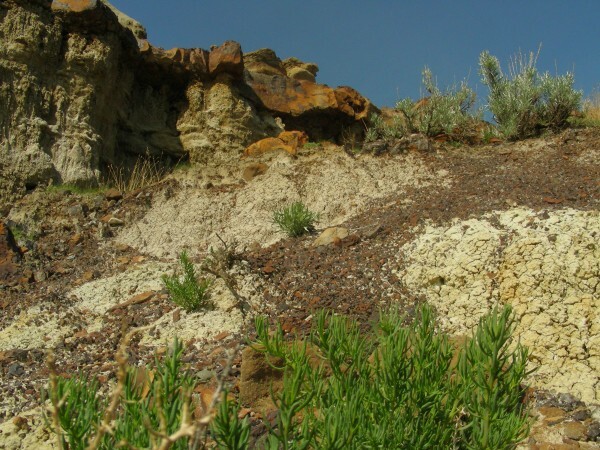 The badlands in Dinosaur Provincial Park provide a varied and endlessly fascinating landscape. Most of this area is set aside as a preserve with limited access, but there is a modest public access area that allows for close exploration of these unusual features. Although the badlands are spectacular, they added only a few species not already detected from the monitoring area, including Rock Wren, Say's Phoebe, and Vesper Sparrow. The Lark Sparrow is emblematic of Dinosaur Provincial Park - although one of the most abundant species there, I did not encounter it anywhere else during my Birdathon. As we wrapped up our banding efforts for the day around noon, I had already spent five hours of my Birdathon at this one site, and my list was only just above 40 species - a far cry from some past attempts when I had reached 100 by mid-morning! However, I knew that as soon as I got out of the valley, I'd encounter other habitats, and consequently other birds. My first stop was on the edge of the badlands, where I added Prairie Falcon and Violet-Green Swallow. Moving into the grasslands, I enjoyed the ringing calls of Sprague's Pipits, and watched a Loggerhead Shrike in dense shrubbery. The first little pond I encountered was no more than 50 metres in diameter, but held 9 species of duck (Redhead, Lesser Scaup, Mallard, Gadwall, Northern Shoveler, Northern Pintail, Green-winged Teal, Blue-winged Teal, and Common Goldeneye), plus Wilson's Phalaropes and Killdeer - a sign of the rich abundance of waterfowl and shorebirds to come. 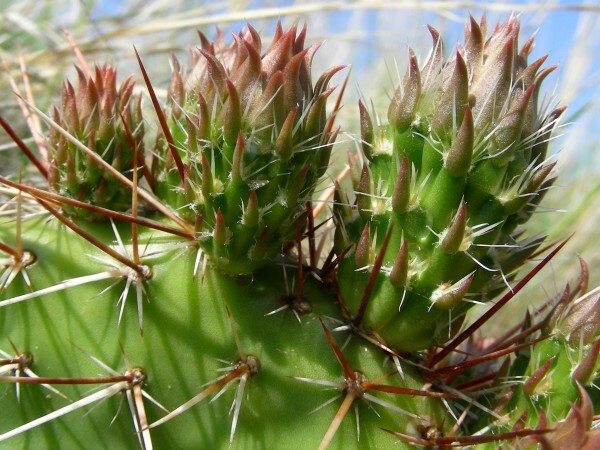 The ubiquitous prickly pear cactus is one of the common plants in Dinosaur Provincial Park. A side trip into Kinbrook Provincial Park on Lake Newell was moderately successful - the park itself was bustling with people since it was the May long weekend, and so bird activity there in early afternoon wasn't great, though a Western Kingbird showed off nicely for me. The access road was more impressive, with plenty of waterfowl again, and the first American Avocets and Marsh Wrens of the day. 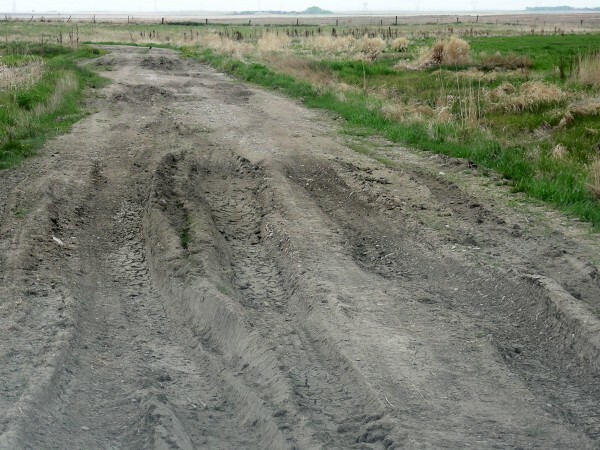 To head back towards Calgary, I decided to take a series of backroads south of the Trans-Canada highway. Within minutes of leaving Kinbrook, a Ferruginous Hawk swooped up to land on a pole beside the road. Just a bit further south, I discovered a shorebird bonanza - 300 or more Black-bellied Plovers, mixed in with smaller numbers of American Golden Plover, Black-necked Stilt, more Avocets, and Least and Semipalmated Sandpipers. I was so enthralled with all them that it took me several minutes to spot the beautiful Cinnamon Teal swimming along the shoreline. It was the second of four species on the day that I had never seen before (the others being the previously mentioned MacGillivray's Warbler, plus Chestnut-collared Longspur and LeConte's Sparrow). The Ferruginous Hawk is a threatened species in Alberta, so it was a pleasant surprise to see one swoop up to perch on a pole right beside the highway. I wasn't quite quick enough with the camera to get off a good shot while it was close, but did get this photo of it as it flew away again, showing it's distinctive wing and tail patterns. As I headed west, I marveled at how every little pond or slough had at least some waterfowl and/or shorebirds, and how often different species had claimed each one - a far cry from the standard Mallard/Killdeer colonization typical in the east. Although I wasn't counting the species as I went along, it was probably somewhere in this stretch that I reached 100 for the day, with species such as American White Pelican, Willet, Whimbrel, Long-billed Curlew, Green-winged Teal, and Ruddy Duck among the potential milestone species. 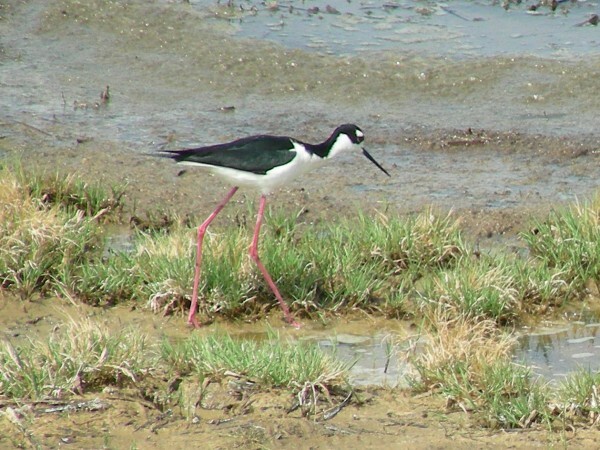 One of North America's most striking shorebirds, the Black-necked Stilt has expanded its range substantially into Canada in recent years. Most field guides don't show it as breeding north of the border, but I saw 4 individuals in total at two sites, and have read reports of them at several additional locations in southern Alberta so far this spring. Around 5 p.m. I was approaching Frank Lake, a large wetland complex southeast of Calgary. There are three main access points and I tried each of them, with success on all counts. At the south end I found a Bank Swallow among a large mixed flock chasing the midges. Heading to the southwest access, I successfully negotiated the rough road and came to a view of a spectacular array of ducks and grebes, plus a persistently whinnying Sora. Then at the north end, I walked down the long path toward the lookout platform, and spotted my only Canvasback, Black-crowned Night Heron, and Forster's Terns of the day. Wandering back to the car, I heard a weak but distinctive song to my right - at last, my long-awaited first encounter with a LeConte's Sparrow! With a bit of patience and luck, I even saw a brief glimpse of it scurrying among the short grasses. The excitement of the moment was offset by a momentary fright when I realized that a skunk was standing just three metres away, with tail raised, ready to fire ... had it not been for getting distracted by the sparrow, I might have well blundered right into it! These ruts don't look quite so forbidding in the photo above, but some are as much as 40 cm deep - far more than enough to bottom out my Civic! But the lure of the Frank Lake marshes beyond was too much to resist - I carefully negotiated several sets of these, and was amply rewarded by my only Sedge Wren and Western Grebes of the day, plus a close quartet of beautiful Cinnamon Teal and a flotilla of over 60 actively courting Ruddy Ducks. Of course some other mammal experiences are a bit less nerve-wracking. Only six species made the list this time around. Nuttall's Cottontail and Mule Deer were common at Dinosaur Provincial Park, Richardson's Ground Squirrels were widespread along the prairie roads, and in the spruce forest at Brown-Lowery Provincial Park there were a couple of Red Squirrels. 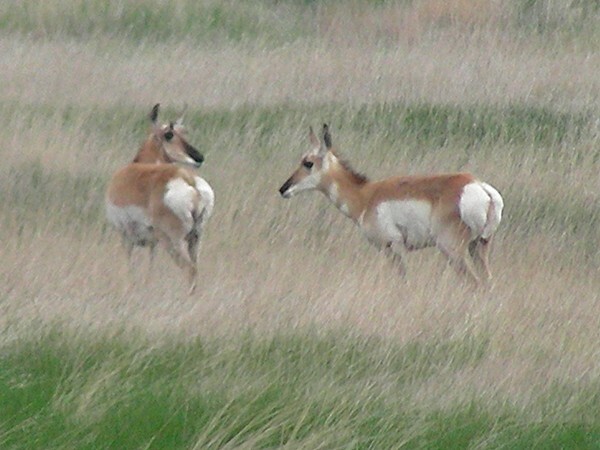 However, aside from the skunk, the most memorable species was the Pronghorn, two pairs of which I saw southwest of Brooks. Pronghorn seem to be rather common in this grassland landscape - this pair was trotting along right beside the road at first, but then retreated a fair distance back as I stopped to observe them. From Frank Lake, my plan was to head into the foothills, where an avifauna largely distinct from that I'd been with all day awaited. Unfortunately that's when the weather turned sour - as seems to be tradition for my Birdathons! The cold rain shut down bird activity very effectively, and I decided against heading far into the foothills, as the weather looked even worse there. After waiting out a downpour in the parking lot of Brown-Lowery Provincial Park for a half-hour, I threw on my rain jacket and wandered into the moist spruce woods, ignoring the continuning drizzle. I walked over a kilometre before I encountered my first bird, a Golden-crowned Kinglet. Over the next 3 km I saw only another 6 species, but 4 of them were new for the day, reflecting the promise of this very different habitat - I can only imagine what the results might have been like in good weather! Highlights here were a beautiful Varied Thrush, and a Ruffed Grouse motionless on a branch by the trail, as if hoping I wouldn't see it. It may be the May long weekend, but there's still plenty of snow to be found in Alberta, even at relatively low elevations. 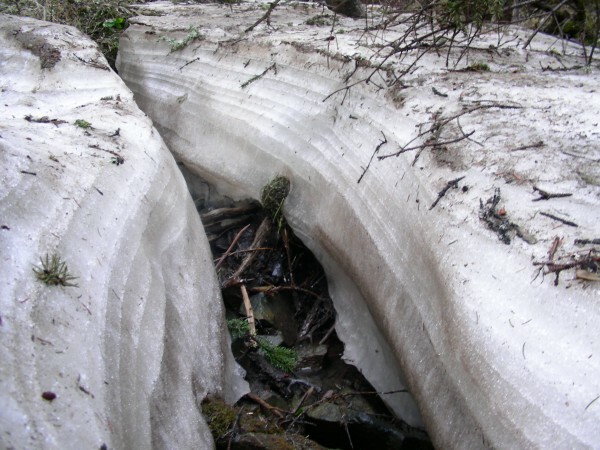 This little "snow canyon", at most a modest half-metre deep, persisted in the dense shade of a spruce forest in Brown-Lowery Provincial Park. The "rain delay" at Brown-Lowery had given me an opportunity to tally up the species for the day, so I knew that with the new additions from the woods, I was leaving the park with a count of 119 - the same total I had reached a week earlier while working on migration surveys in southern Manitoba. Driving out via Priddis, I finally added Ring-necked Duck - the only common waterfowl species for the region that had so far eluded me. Also, a few Mountain Bluebirds were along the fences, but several stops at promising looking woods didn't yield any song - it seems that the rain had quelled any interest songbirds may have had in an evening chorus. 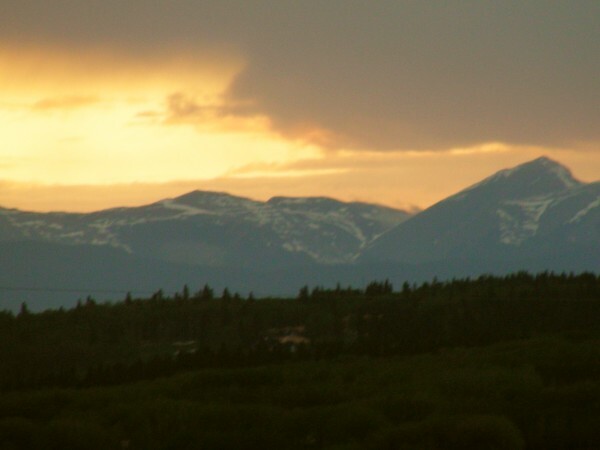 A momentary break in the clouds just before dusk allowed for a brief glimpse of the mountains before dusk. Unfortunately the respite from the rain didn't last long - by the time I reached the outskirts of Calgary, it was pelting down so hard that even with windshield wipers going at double speed, it was hard to see the road ahead. I went to bed planning to walk down into the Bow Valley the next morning to "clean up" some of the forest birds I had missed, before the 24-hour window was over. Unfortunately, the weather didn't improve much overnight - though arguably the heavy wet snow falling as I woke up was less unpleasant than the previous evening's cold rain. The birds didn't make much distinction between the rain and snow, as hardly any were singing in the morning either. I rounded out my list with Downy Woodpecker, Red-breasted Nuthatch, and Lincoln's Sparrow, all at reliable territories, but missed many species that had been regular there in previous days, such as Ruby-crowned Kinglet and White-throated Sparrow. In the end, my count was 124 species. This is relatively low compared to my Birdathon totals of recent years, but I think the blame lies more with the weather than the unconventional strategy I chose - with a decent bit of evening (and/or second morning) song, 140 could have been reached easily ... so there's the challenge for next year! It's interesting to note how different the composition of this year's species list is from the 120 birds recorded on the MBO Birdathon in and around Montreal last May (to read the report on the 2007 MBO Birdathon, click here). The 2006 Quebec outing yielded 10 waterfowl, 7 shorebirds, 4 raptors, and 19 warblers among a total of 72 passerines. This year, with the benefit of the prairie wetlands, but largely lacking productive woods, I had 17 waterfowl, 16 shorebirds, 7 raptors, and just 4 warblers among 60 passerines. 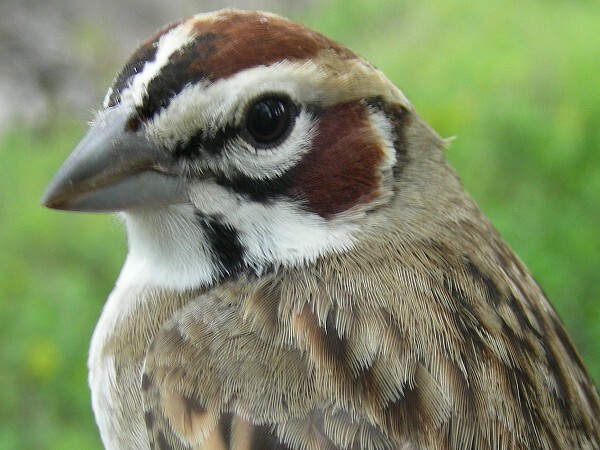 Also notable, sparrows doubled from 6 to 12. Below is the full list of species seen and/or heard during my Birdathon. If you've already contributed to my Birdathon this year, thank you so much for your support! This year we're counting on Birdathon proceeds to fund at least half of McGill Bird Observatory's fall migration monitoring program, and your generosity will help us greatly in striving to maintain consistent coverage from year to year so that we can detect population trends over time. In case you didn't make a pledge in advance of my count, but would still like to support this year's Birdathon, it's not too late to make a flat-rate donation online. Thank you all! Addendum: Unexpectedly I surpassed my count just three days later in southern Manitoba, with a total of 130 species! I was there to do migration surveys in the area south of Portage la Prairie, and noticed early on in my series of point counts that a considerable songbird migration was underway. I had as many as 13 Tennessee Warblers at one stop, and a mixed flock of 25 Chipping and Clay-coloured Sparrows at another. Although I didn't count up the species until later, I had recorded 96 species by the time I wrapped up my survey around noon. As I had a few hours to kill before my flight home, I made a small detour on the way to the airport to visit Oak Hammock Marsh. The highlight there was a spectacular array of 21 shorebird species - which I believe is more than I've ever before seen in a single day! There were over 1000 individuals in total, spooked into flight a couple of times by a Peregrine Falcon. Of course there were also hundreds of coots, ducks, grebes, and several impressively soaring groups of American White Pelicans, but the shorebird spectacle overshadowed all of those. The only downside was that not once, but twice, I again narrowly avoided the business end of a skunk - two of them were lurking in the grass right along the dykes, and only reared up to stare me down at the last moment. I'm not looking forward to my luck with them running out! Although the Manitoba day had a slightly higher count, I'll stick with the Alberta trip as my official Birdathon for 2007, since it's a route I'll be more likely to be able to build upon next year (and also as it was so dismally foggy in Manitoba for most of the day that I heard far more species than I saw and certainly couldn't provide the same sort of photographic documentation of the day ... though I'll include one bonus shot from the day at the bottom of this page). A snapshot from my Manitoba day. 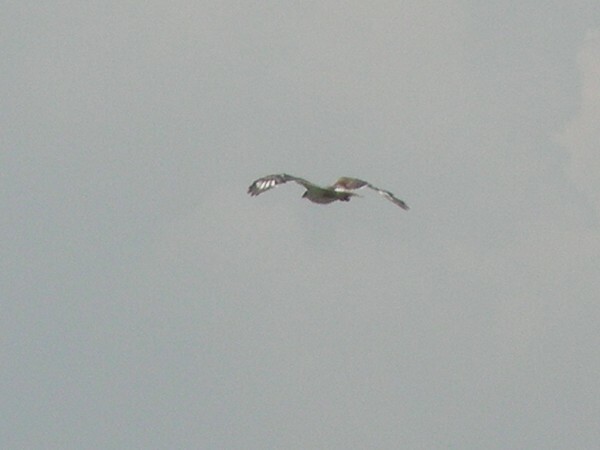 Not as impressive as when they're in flight, but considerably easier to photograph! 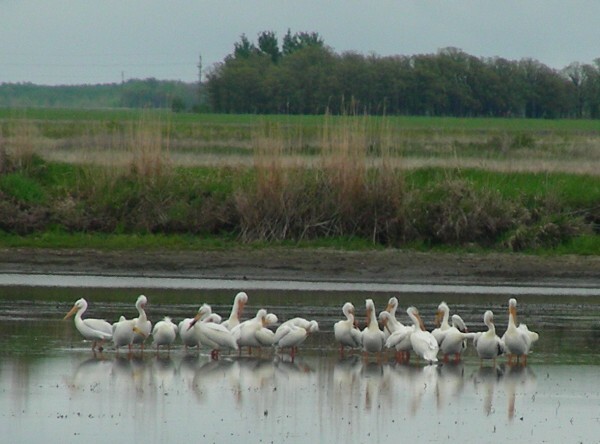 These American White Pelicans were in one of the cells at Oak Hammock Marsh where the water had been drawn down somewhat to provide habitat for shorebirds ... and evidently others.